I’ll be repainting from Razorback Red to teal tonight for sure! 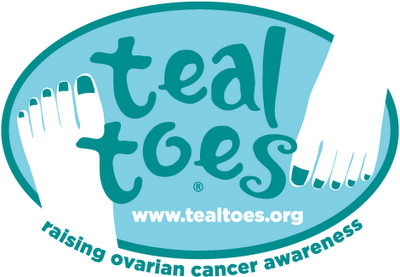 Teal Toes aims to spread the word about ovarian cancer awareness. Here is the site. Ovarian cancer is also known as the whispering killer. September is Ovarian Cancer Awareness month. Teal is the ovarian cancer awareness color. * Too many women with ovarian cancer do not get diagnosed until their cancer has spread. Their survival rate is 45%. * The survival rate improves greatly – to 93 percent – if the cancer is diagnosed at an early stage before it has spread. Only 19 percent of ovarian cancer cases are diagnosed at this local stage. * Approximately 75 percent of ovarian cancer cases are diagnosed at an advanced stage after the cancer has spread beyond the ovary. More info can be found at Ovarian Cancer National Alliance.